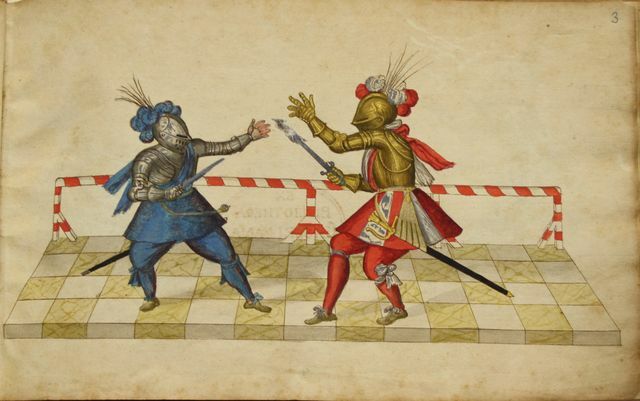 The IGX 2016 Dagger Self-Defense Tournament, based on the BSG VIII Self-defense Challenge, is designed to encourage participants to test and demonstrate armed self-defense skills against a dagger-wielding attacker, using techniques shown in historical treatises. This tournament assumes a very specific context, and it is critical for all participants to recognize and understand this context as it frames the desired behavior for both the attacker and defender. As in BSG VIII, fighters will square off in asymmetric roles: one focused on offense and the other focused on defense. Emphasis is not only on controlling the opponent’s weapon, disarming, and throwing; but also to make use of one’s own dagger. Each fighter will be required to perform both of these roles during the course of the bout. The tournament assumes a scenario where the attacker launches a committed and repeated assault to fatally stab the defender. Attackers focus on overwhelming the defender with the weapon, throwing strong direct committed attacks; Defenders have very limited time and space to react, and do not have the luxury of escape as an option. Both fighters must use the ice-pick grip. Pushing the opponent (e.g. elbow-push). Bouts will take place on a circular ring, approximately 10m in diameter on indoor turf. The Defender will start inside a 1m diameter circle at the center of the ring. The Attacker will start outside of the ring. Forte Swordplay-custom collapsible leather-covered daggers will be provided to fighters. The head and torso. Strikes to the arms/legs do not stop an exchange or yield points. The Dagger Self-Defense Tournament will be held in 2 stages: a qualifying stage with pools and a single-elimination finals stage with the top 4 contenders. The Defender starts inside a 1m diameter circle at the center of the ring. The Attacker starts outside of the ring. To encourage the Defender to stand and defend rather than immediately retreat from the committed attacks of the Attacker, the Defender must keep one foot inside the starting circle until contact is made with the Attacker. Both Attacker and Defender must have their daggers drawn in ice-pick grip. When the exchange begins, the Attacker proceeds to the center of the ring and attempts to stab the defender. Once the Attacker breaches the 1m diameter circle at the center of the ring, the Attacker has 5 seconds to attempt to stab the Defender. At the same time, the Defender can move anywhere inside the full 10m ring. The goal of the Defender is to accumulate points by controlling the attacks of the Attacker. These points accumulate and carryover to future bouts until the finals, when they reset. The exchange is halted at the end of 5 seconds, as soon as the Attacker delivers three successful stabs to the Defender’s head/torso, or if the Defender executes a successful defensive technique (see below). A successful stab must be made with a movement from the shoulder or elbow. In particular, stabs executed by moving the wrist while the arm is pinned are not valid. Survival: 1 point if the exchange continues for the full 5 seconds, and the Attacker has not executed three successful stabs. Disarm: 2 points if at any point the Attacker is not holding a dagger. Counter-stab: 2 points if the Defender can stab the Attacker while controlling the Attacker’s weapon. The Attacker’s weapon arm must be securely grabbed, wrapped up, or pinned at the moment when the strike is delivered. Merely blocking or pushing the weapon away is not sufficient. Counter-stabs may be delivered with the Attacker’s own dagger or the Defender’s dagger. Takedown: 3 points. The exchange ends immediately if either fighter goes down. The Defender scores if he remains standing, or lands in a position of control so that the Attacker is unable to escape or counterattack. Otherwise, there is no score for the exchange. Ring-out: 1 point if the Attacker leaves the ring. If the Defender leaves the ring, the exchange ends with no score. All scoring actions end the exchange immediately. Scoring is not cumulative. If the Defender executes multiple scoring techniques simultaneously (such as a Disarm and a Takedown), he receives points for the more valuable technique. The Defender continues to defend for 5 exchanges, or until 3 exchanges with successful attacks, whichever comes first. When the referee sees a successful technique, or hears a judge call “Point,” they call “Halt.” The referee and judges then confer as necessary to determine the score. If a “Halt” is called but no action has occurred which ends the pass, the judges will confer and determine how many successful stabs the Attacker has made so far. That count is announced to the fighters. The pass then continues with whatever time was remaining before the halt.